In the map* below you can see per each state of Venezuela the amount of citizens per pupil for the year 1920. 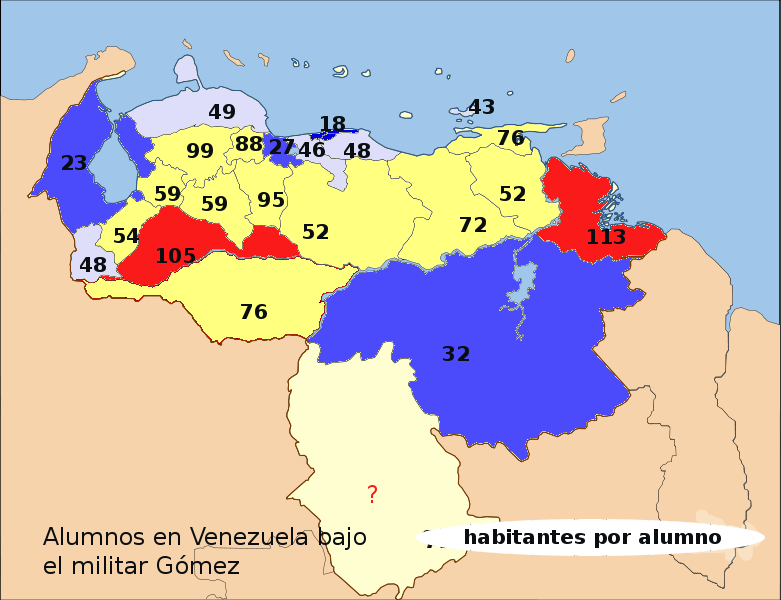 So: in Zulia, to the West, 1 out of 23 inhabitants was a pupil. Considering the age distribution of Venezuela back then, it means just a tiny minority of children was going to school. In the Llanos the situation was much worse, though. In Barinas, for instance, only 1 out of 105 persons was at that moment going to school. In the Delta (to the East), it was only 1 out of 113. The average child had almost 5 more chances to be attending school if he was living in or around Caracas, Valencia or Maracaibo than in the Llanos or many other places. And still most were not going to school. Only my maternal grandmother, living close to Valencia, went to school - for two full years. My other grandmother was illiterate and my grandfather had a similar education as my maternal grandmother - who was single parent. The situation improved a lot after 1940, specially quantitatively. My parents, like most others, profited from that. Still, the difference between the average level in Caracas and a few other places and the "countryside" was and still is enormous. And what many people don't understand: that "countryside" is now full of middle-size cities. It's no longer just rural but home to millions...and it keeps being extremely backward. *I derived this data from this fascinating German book compared with Venezuela's census for 1920.